Reborn midsize picking aims to make a big splash. 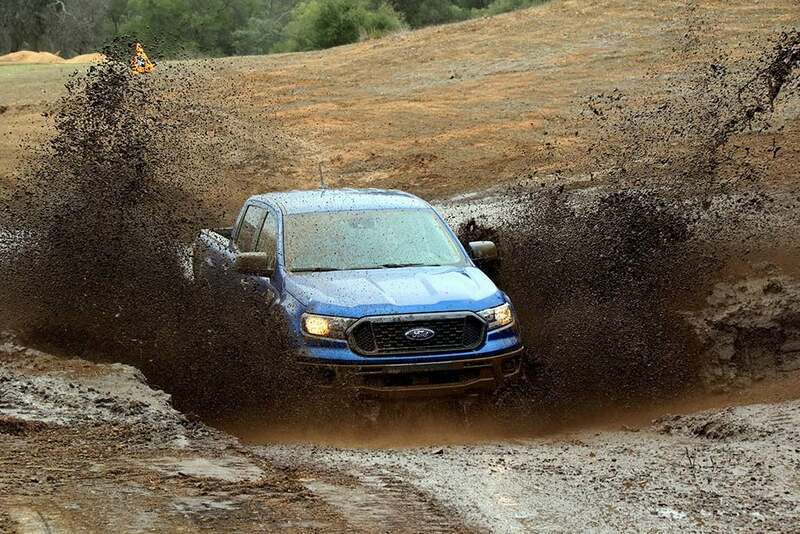 Making a splash: the 2019 Ford Ranger FX4 wraps up an off-road run with a mud bath. It’s been more than six years since the last truck rolled out of Ford’s ancient assembly line near Minneapolis, bringing to a seeming end production of the automaker’s archaic Ranger pickup. While Ford was getting ready to launch a new model for international markets, however, it decided to let the venerable Ranger name die in the U.S. It apparently seemed a good idea at the time. The midsize market was all but dead and even Detroit rivals General Motors and Fiat Chrysler were quitting the segment. Ford execs, all the way up to then-CEO Mark Fields, insisted they could move Ranger buyers up to the larger – and far more profitable – F-150. But a funny thing happened that threw Ford’s strategy into disarray. For the 2015 model-year, GM launched two all-new trucks, the Chevrolet Colorado and GMC Canyon, triggering a rapid rebound to the seemingly moribund midsize pickup segment. After hemming and hawing, Ford finally acknowledged its error and raced to bring the Ranger back to life, heavily modifying the model already on sale in markets as diverse as Abu Dhabi and Thailand. Finally, the 2019 Ranger is getting ready to roll into U.S. showrooms and we had a chance to test its mettle during an extensive on- and off-road drive event in and around San Diego last week. As you might expect, the reborn Ranger has a lot in common visually with the international truck. It features a bold version of the familiar Ford grille framing an oversized Blue Oval badge. The headlamps flow smoothly into the front fenders, with the windshield steeply raked, both details reflecting on the way designers set out to improve aerodynamics to maximize fuel economy – which, at a max 23 mpg combined is best-in-class. The 2019 Ford Ranger proved more than competent both on-road and off. There’s enough machismo to the new truck, with its sculpted hood and flared wheel wells, to give it a sense of tough sure-footedness. A closer look reveals some other steps taken to enhance the durable, go-anywhere nature Ford aimed to engineer in, including a new steel bumper not used on the global version of the Ranger. If you were given a blindfold test and plopped inside the cabin you’d know it was a Ford the moment the blinders were removed. It’s a bland, but nonetheless competent, interior design with a driver having easy access to conventional controls, including climate and real volume and tuning knobs. There’s also little to fuss or fret about if you’re operating any of the truck’s off-road systems, such as terrain management control – which automatically optimizes various vehicle settings for conditions like snow, sand or mud and ruts. The new Ranger delivers a fairly sophisticated level of technology, even on base models. Depending on the grade you’ll get things like the latest Sync 3 infotainment system. It now has integrated both Apple CarPlay and Android Auto. The system is controlled by an eight-inch touchscreen that, perhaps because of the large frame surrounding it, looks oddly small. 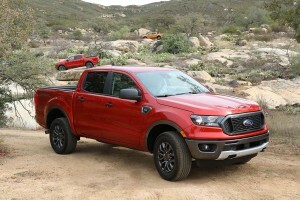 The 2019 Ford Ranger offers three cab and two bed options but only one powertrain. 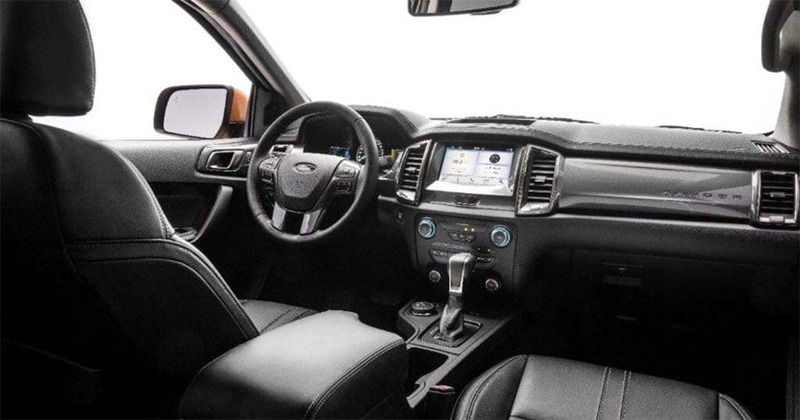 Advanced driver assistance systems have become a prerequisite these days, and Ford has loaded Ranger up with a reasonable suite, including forward collision warning with automatic emergency braking, blind-spot monitoring and active cruise control which, oddly, only operates down to 12 mph, making it fairly useless in heavy rush-hour traffic. The standard backup camera can be upgraded, and can even provide a 270-degree view if you’re towing a trailer. There are a number of systems specifically designed for serious trucking and, in particular, towing and off-roading. One combines both hill climb and hill descent control, allowing you to set a speed as low as 1 mph to crawl over rough terrain. During a back-to-back comparison we found the Ford system to be far more effective than what’s offered on a comparable Toyota Tacoma – traditionally seen as the most off-road-capable of midsize trucks. As you would expect of any pickup, there are a variety of combinations available, including three cab and two bed sizes. 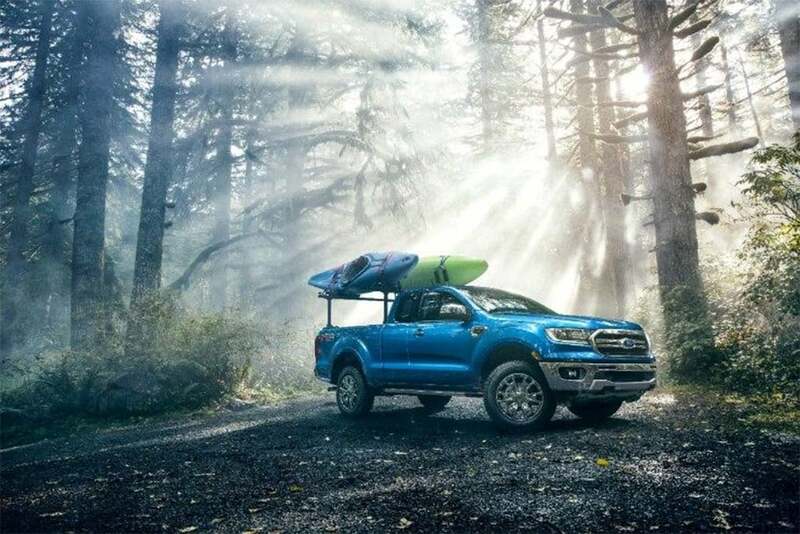 But where F-Series buyers have a broad range of engines to choose from, Ford is equipping all Rangers with a single powertrain package, a 2.3-liter EcoBoost inline-four making 270 horsepower and 310 pound-feet of torque. The pony count is relatively mid-segment but the torque is second only to what you’d find in the Colorado and Canyon diesel models. The Ranger's FX4 package improves off-road capabilities but doesn't match that of the Toyota Tacoma or Chevy Colorado ZR2. The EcoBoost engine is paired to a 10-speed automatic, much like the bigger F-150, and can send power either to the rear wheels or all four. There’s a single four-wheel-drive package which requires drivers to switch, albeit on the fly, from 2H to 4H or the 4-Low mode for off-roading. Ford officials say they will be watching to see if there’s also demand for an auto-shifting all-wheel-drive alternative. While towing and cargo-hauling power traditionally rank high among consideration factors for truck buyers, mileage still matters and, even with gas now down below $2.00 a gallon in some parts of the U.S., Ford will have real bragging rights with Ranger. Though it can’t match the numbers of those GM diesels it still delivers 21 mpg City, 26 Highway and 23 Combined with the two-wheel-drive model. The 4WD Ranger comes in at 20/24/22. The gas Colorado, at best, manages 20 City and 26 Highway. Despite its modest size, the four-cylinder engine provided plenty of pep while driving and Ford’s 10-speed is among the best of the new generation of gearboxes, never struggling to find the right gear no matter what the terrain, now when towing or being driven off-road. On-road, you’ll recognize this is a “truck-truck.” It’s not quite as smooth and car-like as the Honda Ridgeline. That said, it was surprisingly comfortable, even on rougher roads, with only moderate levels of body roll in hard corners. Steering was precise and more predictable than most competing midsize pickups, with just the right level of road feedback through the steering wheel. It also helped that the seats offered good support to keep you well-positioned while soaking up harder bumps. The reborn Ranger has some of the midsize segment's best cargo and towing numbers. Ranger really shines when you check out the numbers that matter most for truckers. It can haul up to a 7,500-pound trailer, for one thing. And its cargo capacity nudges up there with the best-in-class, starting at 1,560 lbs and climbing to 1,860 lbs on the four-door, rear-drive package. That handily tops both Tacoma and the GM sibling. For those who do any serious towing, meanwhile, there’s an optional tow package that makes it easier to hitch, tow and un-hitch. We were surprised when Ford announced plans for a Ranger Raptor – and then say it wasn’t coming to the U.S. market. We got the sense, during our time with company officials, that this decision might be revisited, as well. It certainly would make sense considering the optional packages offered by some of Ford’s competitors. Chevrolet, not satisfied with the extremely off-road ZR2 edition is now launching the Colorado ZR2 Bison, demonstrating its capabilities earlier this autumn by taking journalists rock climbing. 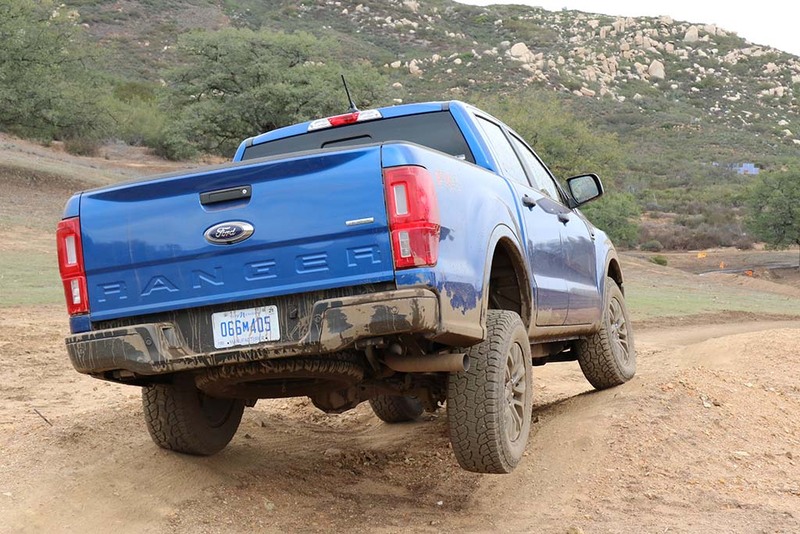 That said, the new 2019 Ford Ranger is no soft-roader. Particularly with the Ranger FX4 package it offers serious off-road capabilities right out of the showroom – as Ford demonstrated on an extended trail it had carved out for us in the hill country outside San Diego. One always has to go out on such routes questioning how they were designed but this was a serious stretch with pretty much everything an off-roader might expect but for a real boulder climb. And the new Ranger showed off its stuff with flair, jouncing down a series of steps, rolling around a banked curve at as much as 26 degrees of incline and more. A plain but functional interior with great seats. The FX4 offers several critical features that ensure it will keep rolling, starting with 31-inch off-road tires and 8.9 inches of ground clearance. There are full skid plates, front and rear, an electronic rear differential system, and both the terrain management control and trail control systems mentioned earlier. The Tacoma, ZR2 and new ZR2 Bison have better approach, breakover and departure angles, something that might give pause to serious trail blazers, but for most everyone else, the new Ford truck proved pleasantly competent, right down to our splash through a deep mudhole. 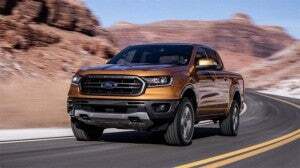 The 2019 Ford Ranger joins an increasingly vibrant, albeit crowded and competitive midsize truck segment – one that will grow even more crowded next year with the arrival of the eagerly awaited Jeep Gladiator. Pricing will matter for many buyers and for those on a bargain budget the generally forgettable Nissan Frontier, starting at $18,990, makes its best case. The Chevy Colorado comes in at $21,150 before delivery, giving it at roughly $3,000 advantage over the base 2019 Ford Ranger which starts at $24,300 before adding in the $1,095 delivery fees. Load up the high-line Lariat and you can nudge into $40,000 territory, especially if you add the FX4 package, at $1,295. Those are numbers that could take some midsize buyers aback, but considering the truck’s capabilities, whether simply cruising down the highway, hauling a trailer or attacking a backwoods trail, it’s a reasonable price to pay. Ford took plenty of jabs for failing to initially recognize the potential of the U.S. midsize market. But while it’s late to the party it has arrived well-dressed. This entry was posted on Tuesday, December 18th, 2018 at and is filed under Automakers, Automobiles, Business, Chevrolet, FCA, First Drive, Ford, Fuel Economy, GM, GMC, Honda, Infortainment, Markets, Nissan, Pickups, Reviews, Safety, Safety, Sales, Technology, Technology, Toyota, Trends, U.S./North America. You can follow any responses to this entry through the RSS 2.0 feed. Both comments and pings are currently closed. I’m confused. Is $25.4K really a high price for a new pickup truck in a world where people are paying more for a new Camry sedan that’s only a medium trim level and V6? If it’s the $40K+ appointed truck that bothers you, then I’d say no vehicle on the road today in which a customer chose options which drives up the price more than $6K from the base price is a good value (basically everyone who pays thousands more for more gadgets and comfort have lost the chance to get value in a vehicle purchase; pickups included. It is true that the mid and upper end prices have gone crazy; but those trucks, and in some cases, cars, aren’t forced upon us and are absolutely not necessary.One can still choose a new F150 today with a ten speed and a 6.5′ bed and 400 ft-lb torque power train (90% at 1900 RPM), with combined mpg at 22, with good truck capability for less than $30K. That’s good VALUE. And now a Ranger can be had with 310 ft-lb, 1860 payload, up to 7500 towing capability, with 23 mpg combined epa estimate for FE, and some new standard safety features for $25.4K. I’d say that’s a pretty good deal compared to just about any other segment out there except the small compact segment where a Mitsubishi Mirage (for one) can be had for around $12K. Sedans, Crossovers do not really beat the new Ranger for value. From the article: “Though it can’t match the [FE] numbers of GM diesels, it still delivers 21 mpg City, 26 Highway, and 23 Combined with the two-wheel drive model”. Well that’s not exactly true. It depends on which mpg estimate number or numbers mean the most to any particular driver or customer. For some very odd reason to which GM has given no explanation, back in August, the GM Canyon / Chevy Colorado with the 2.8L Duramax rear drive suddenly dropped from 22/31/25 in its max mpg estimate configuration, to now at only 20/30/23 (which is lower than 2WD F150 PowerStroke V6). This means that the new Ranger actually gets 1 higher in the city and equal in the combined rating compared to the Duramax, while falling by a whopping 4 mpg on the highway. And while I’d personally call that “not matching GM’s numbers” as someone who lives in a rural area; some city dwellers might consider the Ranger just as efficient for certain driving scenario, at least comparing EPA estimate to EPA estimate with the baby Duramax-powered pickup; especially when one considers the inconvenience to purchase diesel fuel as a city commuter where the fuel is not very price competitive in urban areas; making a fuel that’s already a good 40% higher priced in a competitive retail establishment currently, to an even higher premium in the urban environment. In other words, diesel fuel or practically no other American product is as competitive as gasoline, and so if you buy a diesel-powered vehicle and drive only in urban areas; you’ll either have to drive out of town to get a good price a truck stop; or pay ten to fifteen more cents per gallon buying diesel at an urban fuel stop. There is also that elephant in the room that many writers never mention. Value is hardly ever considered or “valued” in reviews, and if value were highlighted more, Ford is the value leader in trucks and the new Ranger continues that strategy, because Ford is the only manufacturer that offers their best and most advanced power trains to all their customers at all price levels. We know this turbo charged gas engine mated to a ten speed is the same power train for all trim levels and configurations that only Ranger has in the segment, but, with GM for instance, if one chooses a diesel Colorado or Canyon, then he or she has to start shopping and looking at a diesel-powered, mid-size pickup at $36K minimum; they must choose a crew cab; and must choose a minimum trim level; and beyond that, they must choose some standard features only forced on Duramax buyers; versus a turbo-charged gas-powered Ranger that has an mpg estimate nearly as good starting at only $25.4K. The Ranger is offered in every configuration and trim level with this same advanced power train. This price variation between gas turbo versus diesel turbo is less important if a customer actually wants a fancy pickup with four big doors and every active safety feature available and 4 adult seating where the diesel first appears on the pick sheet, as then the diesel adds only $3,700 to an equally-equipped crew cab Colorado or Canyon with their V6. If, however, you are a customer that values good torque down low via turbo charging and good mpg, which both the Duramax and the Ecoboost can provide, but want only a work truck with just an added feature or two, then the diesel is way too much truck price wise and feature wise and length wise in order to get a diesel engine. On the other hand, if you’re a prospective mid-size truck buyer and don’t value the refinement and capability brought about by the Ranger’s Ecoboost engine mated to a ten speed and find an NA 4 banger with a manual transmission acceptable, then competition has the Ranger beat, because in that shopping scenario one can get a manual transmission, naturally-aspired four banger for around $21K in extra cab and 6′ bed, except for the ancient Frontier which can be had below $20K. This is the one area I feel that Ford should have reached down just a little more to attract price-conscious customers while still offering this great engine. They could have come down just a little on that starting price by offering and promoting rear seat delete with about $100 more discount ($350 instead of $250), which would likely still add to their margin considering the cost of seats and safety equipment that are mandated with them; and then they could have easily offered another $500 off by simply carrying over the Mustang Ecoboost mated to that already-manufactured, 6-speed manual as the most basic choice. This way, Ford could be offering a turbo charged Ranger for around $850 less than the $25.4K starting price; and even though they likely would not be selling many units equipped in that most basic guise just as the case with the competition; they’d #1 have a lower starting price to advertise; and #2, they’d have the only premium-performing power train in the segment that can be mated to a manual transmission, and is a combination which is already in production for another platform.